Welcome to the wonderful world of Fairfield, a unique community featuring a master plan designed to appeal to residents of all ages. In Fairfield, home is a retreat where residents can live, play and relax in a small town environment far away from the hustle and bustle of the big city, yet close to every convenience. 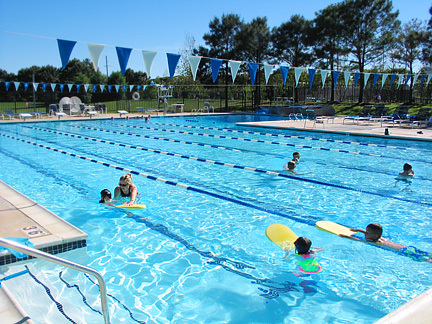 Fairfield offers a world of amenities such as miles of paved greenbelt trails that wind around lakes, through woods and connect residents to parks, five neighborhood swimming pools, retail conveniences, Ault and Keith Neighborhood Elementary schools and the popular Fairfield Athletic Club. Surrounded by a 20-acre landscaped sports park, the Fairfield Athletic Club provides residents with the opportunity to enjoy a facility that has all the features of a private health club with no monthly membership fees. The Club features a gymnasium, competition-size swimming pool, weight room, tennis courts and soccer and ball-fields. Residents enjoy its diverse programs, which include basketball, softball, and soccer leagues as well as swimming and child care programs. The Club also serves as the social focal point of Fairfield, hosting celebrations, town meetings, casual gathering, a long list of sports competitions, plus many more exciting special events and activities. The sports park with baseball and soccer fields is a total of 20 acres. Looking for a community with an excellent school system? 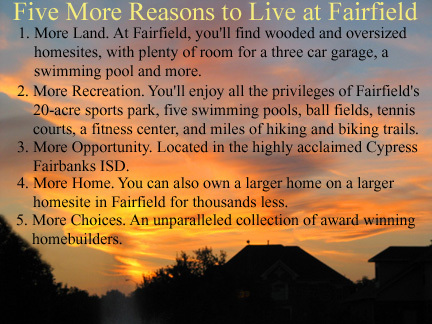 Located in the highly acclaimed Cypress-Fairbanks ISD, Fairfield children attend outstanding schools at all levels. Fairfield's own Ault Elementary is a shinning example of the quality of education offered to children in the Cy-Fair District. This exemplary rated school, located along Fairfield's greenbelt system, boasts a long list of student and teacher achievement and continues to thrive on the support of the Fairfield community. Fairfeild has assembled an unparallel collection of award-winning home builders who offer a wide variety of home styles, floor plans, home sizes and price ranges. Select your home on an over-sized or wooded homesite. 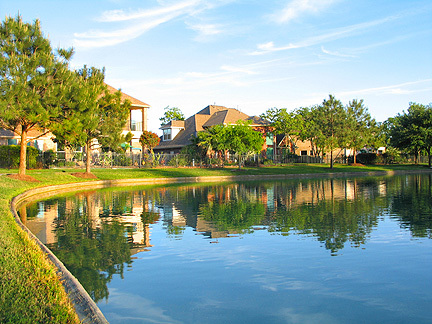 Choose a private cul-de-sac, or a homesite that overlooks one of Fairfield's sparkling lakes. In Fairfield you can own a larger home on a larger homesite for thousands less than other master-planned communities in Houston. So there's plenty of room for all your trophies...from your little leaguer's prize to yours in the three car garage. So whether you're starting a family or just ready to be the two of you again, you're sure to find exactly what you're looking for in Fairfield. City close yet country quiet - that's Fairfield - a northwest community for families who want more out of life. Enhancing Fairfield's lifestyle is a carefully planned retail area that offers residents a host of conveniences close to home. In addition to a gas station and two day care facilities, Fairfield Village Square and Country Shops of Fairfield Phase I and Phase II offer residents the most essential daily services right in their own community. A bank, dry cleaners, real estate office and restaurants are just a short walk or bike ride away.